Originally created in the late 1960’s, early 1970’s; the bean bags were an extremely popular form of furniture. 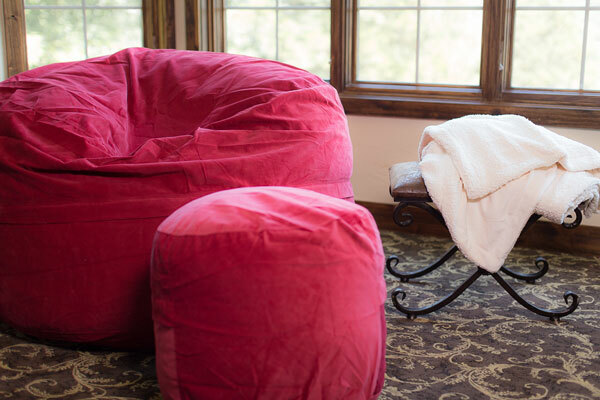 Coined "mod" furniture, the bean bag chair resurrected it popularity in the 1990’s. The bean bag was filled with Styrofoam or polystyrene beads. These beads were used to fill and plump the bag for comfort. One of the problems later identified with beanbags were that after continual use, the beans began to break down and flatten. Once this occurred the bag was not able to provide the same level of comfort. More than two decades later, the new bean bags exchanged their Styrofoam beans for shredded polyurethane foam; providing a much greater level of comfort. It was at that time that products like the Comfy Sack, LoveSac and Foof Chairs were created. The new style bean bags, later coined oversized sacks, began growing in popularity. The higher quality shredded polyurethane added comfort that had previously diminished in the older style bean bags. The oversized sack had increased the size, durability, quality and availability of vibrant colors and fabrics. With this new evolution of the bean bag chair, Comfy Sacks were introduced in 2002. Find out more about Comfy Sacks and how it originated by visiting the about us page. In addition to the limited life of the Styrofoam beans, consumers later became alerted to a very scary fact. Styrofoam and polystyrene beads often create static causing them to cling. When bean bags popped or the fabric was torn these beans were exposed. Once exposed, these beans could cling to you or your clothing. It was later found that small children were suffocating by accidentally inhaling these beans; creating a recall by many bean bag chair designers. Polyurethane foam (also referred to as shredded foam) has been successfully used by high end furniture manufacturers for its ability to create soft edges, maintaining its shape, durability and increased level of comfort. The switch to shredded foam removed the possibility of suffocation and provided safety to children; as well as peace of mind to parents. You can also find polyurethane foam in automobile seats and headrests because of its ability to last for years and years. With this transition, oversized sack manufactures saw an opportunity to use this technology when creating what would be the ultimate bean bag.